The new Ford Focus was already deemed to be one of the safest hatchbacks on the market, achieving a five-star rating in crash tests, but safety assessment body Euro NCAP has delved deeper into the car’s advanced driver assistance technology – and it has come up very pleased. Ford was invited to participate in Euro NCAP’s first event aimed at highlighting the benefits of driver assistance systems, evaluating the Focus’ adaptive cruise control, speed sign recognition and lane-centring. Adaptive cruise control helps the car maintain a comfortable driving distance from vehicles ahead, while lane-centring reduces stress during long road trips by helping keep the vehicle in the middle of its lane. Finally, speed sign recognition can adjust the vehicle speed to within legal limits by monitoring the roadside and overhead gantries for speed signs in addition to using information from the on-board navigation system. Euro NCAP secretary general Michiel van Ratingen hailed the systems as ‘balanced’ and ‘intuitive’. Praise like this made Thomas Lukaszewicz, Ford’s automated driving manager, very happy. He revealed that the key challenge was developing systems that kept the driver informed of all situations and allowed the driver to feel completely in control. “The all-new Focus ‘co-pilot’ feature has got your back, but never encourages you take your attention away from the task at hand,” Mr Lukaszewicz added. 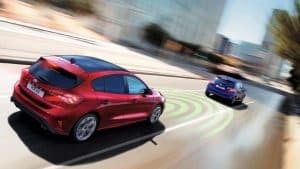 Other sophisticated driver technologies in the new Focus includes the radar-based evasive steering assist, pre-collision assist, pedestrian and cyclist detection and adaptive front lighting system.